In Spite of their best efforts and intentions, sometimes corporates find themselves in financial difficulty because of factors beyond their control and also due to certain internal reasons. For the revival of the corporates as well as for the safety of the money lent by the banks and FIs, timely support through restructuring in genuine cases is called for. However, delay in agreement amongst different lending institutions often comes in the way of such endeavors. Based on the experience in other countries like the U.K., Thailand, Korea, etc. of putting in place institutional mechanism for restructuring of corporate debt and need for a similar mechanism in India, a Corporate Debt Restructuring System was evolved, and detailed guidelines were issued. Based on the recommendations made by the Working Group to make the operations of the CDR mechanism more efficient (Chairman: Shri Vepa Kamesam, Deputy Governor, RBI), which was constituted pursuant to the announcement made by the Finance Minister in the Union Budget 2002-2003, and consultations with the Government, the guidelines of Corporate Debt Restructuring system have since been revised and detailed hereunder for implementation by banks/ FIs. The revised guidelines are in supersession of the extant guidelines outlined in the aforesaid circular dated August 23, 2001. The objective of the Corporate Debt Restructuring (CDR) framework is to ensure timely and transparent mechanism for restructuring the corporate debts of viable entities facing problems, outside the purview of BIFR, DRT and other legal proceedings, for the benefit of all concerned. In particular, the framework will aim at preserving viable corporates that are affected by certain internal and external factors and minimize the losses to the creditors and other stakeholders through an orderly and coordinated restructuring programme. The scheme will not apply to accounts involving only one financial institution or one bank. The CDR mechanism will cover only multiple banking accounts / syndication / consortium accounts with outstanding exposure of Rs.20 crore and above by banks and institutions. The Category 1 CDR system will be applicable only to accounts classified as ‘standard’ and ‘sub-standard’. There may be a situation where a small portion of debt by a bank might be classified as doubtful. In that situation, if the account has been classified as ‘standard’/ ‘substandard’ in the books of at least 90% of lenders (by value), the same would be treated as standard / substandard, only for the purpose of judging the account as eligibile for CDR, in the books of the remaining 10% of lenders. There would be no requirement of the account / company being sick, NPA or being in default for a specified period before reference to the CDR system. However, potentially viable cases of NPAs will get priority. This approach would provide the necessary flexibility and facilitate timely intervention for debt restructuring. Prescribing any milestone(s) may not be necessary, since the debt restructuring exercise is being triggered by banks and financial institutions or with their consent. In no case, the requests of any corporate indulging in wilful default, fraud or misfeasance, even in a single bank,will be considered for restructuring under CDR system. The accounts where recovery suits have been filed by the lenders against the company, may be eligible for consideration under the CDR system provided, the initiative to resolve the case under the CDR system is taken by at least 75% of the lenders (by value). However, for restructuring of such accounts under the CDR system, it should be ensured that the account meets the basic criteria for becoming eligible under the CDR mechanism. BIFR cases are not eligible for restructuring under the CDR system. However, large value BIFR cases, may be eligible for restructuring under the CDR system if specifically recommended by the CDR Core Group. The Core Group shall recommend exceptional BIFR cases on a case-to-case basis for consideration under the CDR system. It should be ensured that the lending institutions complete all the formalities in seeking the approval from BIFR before implementing the package. Reference to Corporate Debt Restructuring System could be triggered by(i) any or more of the creditor who have minimum 20% share in either working capital or term finance, or (ii) by the concerned corporate, if supported by a bank or financial institution having stake as in (i) above. Though flexibility is available whereby the lenders could either consider restructuring outside the purview of the CDR system or even initiate legal proceedings where warranted, banks / FIs should review all eligible cases where the exposure of the financial system is more than Rs.100 crore and decide about referring the case to CDR system or to proceed under the new Securitisation and Reconstruction of Financial Assets and Enforcement of Securities Interest Act, 2002 or to file a suit in DRT etc. CDR will be a non-statutory mechanism which will be a voluntary system based on Debtor-Creditor Agreement (DCA) and Inter-Creditor Agreement (ICA). Forum shall have to enter into a legally binding agreement, with necessary enforcement and penal clauses, to operate the System through laid-down policies and guidelines. The ICA signed by the creditors will be initially valid for a period of 3 years and subject to renewal for further periods of 3 years thereafter. The lenders in foreign currency outside the country are not a part of CDR system. Such lenders and also lenders like GIC, LIC, UTI, etc., and other third parties who have not joined the CDR system, could join CDR mechanism of a particular corporate by signing transaction to transaction ICA, wherever they have exposure to such corporate. 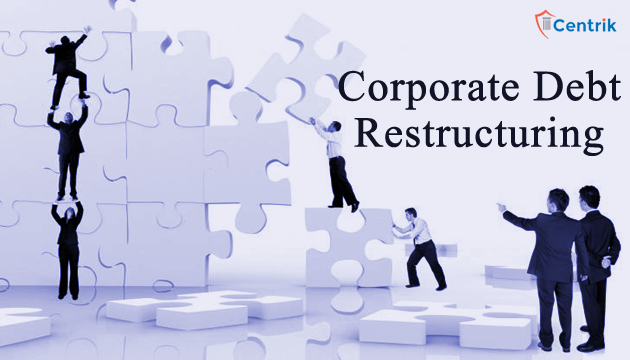 Corporate Debt Restructuring (“CDR”) mechanism is a voluntary non statutory mechanism under which financial institutions and banks come together to restructure the debt of companies facing financial difficulties due to internal or external factors, in order to provide timely support to such companies. The government has taken this step to regulate the stressed assets or products sold on credit by the big corporates, and who failed to realize their bad debts. This step was essential for healthy functioning of the Indian market and escalate the growth of the economy by efficiently dealing with bad debts and defaulters.